Is Dark Energy Gobbling Dark Matter, and Slowing Universe's Expansion? 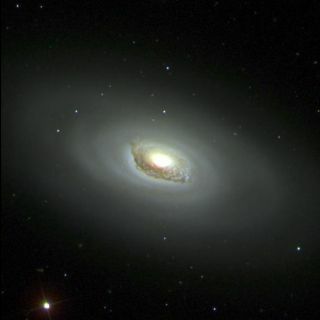 Astronomers using galaxy images like this one from the Sloan Digital Sky Survey to study the effects, and nature, mysterious dark energy. Dark energy appears to be devouring dark matter and slowing the expansion of the cosmos, a new study suggests. Dark matter makes up the backbone of the universe, and there is five times as much of it in the universe as regular matter that makes up the visible objects in the universe like planets and stars. Physicists have yet to directly detect dark matter and no one knows what it's made of. Scientists can only tell that it exists from its gravitational pull on regular matter. Now, the new research suggests that dark matter might be slowly disappearing before physicists have even caught a glimpse of it. That's because dark matter provides a framework for things like galaxies and planets to form. The new findings suggest that framework is disappearing and slowing the growth of the universe. The reigning model right now is called the Lambda Cold Dark Matter model, and it suggests that there is a constant amount of dark energyknown as the "cosmological constant." The model supports the idea that the universe has been expanding since the Big Bang and its expansion is fueled by dark energy. Einstein originally came up with the cosmological constant to make his equations reflect the idea that the universe is static and staying the same size. Later on, when evidence started piling up that the universe is expanding, Einstein called the cosmological constant his "biggest blunder." However, physicists resurrected the idea when they realized that it could account for the huge amount of dark energy in the universe. While previous studies have supported the cosmological constantmodel, there is evidence that the new data does not fit the model well. For example, the Planck satellite is measuring cosmic microwave background— a remnant of radiation left over from the Big Bang. But the data from the satellite doesn't match up perfectly with the cosmological constant model. In fact, much of the new data collected by this satellite and other experiments that measure how the universe is expanding seem to support a model that includes some kind of interaction between dark energy and dark matter, Wands said. The new model that Wands and the team has proposed is one where the amount of dark energy is growing as it eats away at dark matter. Is dark matter really disappearing? Physicists have known for a while that data from Planck and other experiments doesn't match with the cosmological constant model, said Mikhail Medvedev, a professor of plasma astrophysics and space physics at the University of Kansas who was not involved with the research. Dark matter decaying into dark energy could explain why the data doesn't fit, but it's only one possible explanation, he said. "This is a hint — not a solid result yet — that should stimulate further observational studies," Medvedev said. "It may happen to be real, but it may well go away." Wands said the model needs to be tested against more data. The model also doesn't predict that dark energy will suddenly swallow the entire universe. The interaction that the researchers describe is only between dark energy and dark matter, not regular matter. "This interaction is in the dark sector only," Wands said. "It's a bit of math that we don't care so much about because it's not the stuff that we're made of, so it's not threatening to us."